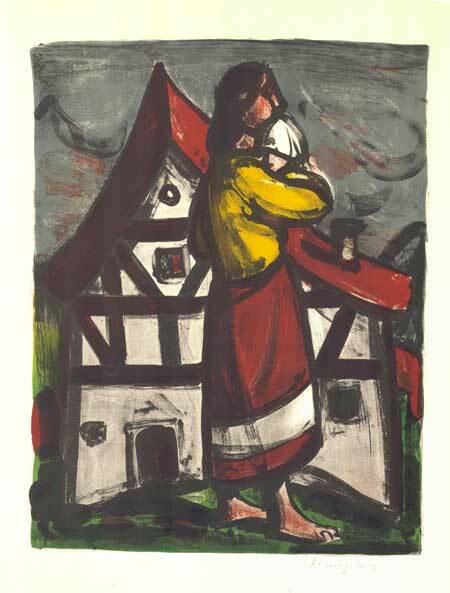 A mother and child in front of a half timber house. Handsigned by the artist. Not numbered. The image has been drymounted on board. The Swiss art historian Adolf Reinle described Max Hunziker as a "Christian Surrealist." This Zurich born painter, graphic artist, and illustrator is perhaps best known internationally for his stained glass windows (including the three choir windows of the Johanneskirche in Bern). 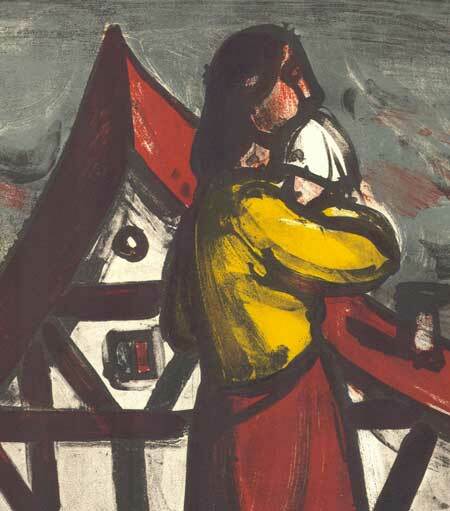 Supported by the Winterthur philanthropist and art collector Georg Reinhard, Hunziker studied in Paris and southern France where he was influenced by Paul Cezanne, Henri Matisse and Georges Rouault. Hunziker's works imbue simple objects with poetic and religious symbolism.